The Hakuhodo J5523 is definitely one of my favorite makeup brushes and also one of the softest I have used so far. The brush head has a flattened oval shape but is more rounded along the edges. This makes it perfect for applying eyeshadow on the lids and then using the softer edge to blend the color. Because the soft goat hair brush can be used with liquid and cream products, I also use this occasionally to blend concealer along my undereye area. I have washed this brush quite a few times, and it washes clean quite easily and has retained it shape so far (the brush does fluff up every so slightly with the first wash but stays the same after that). I haven't had any hair shedding issues with it either. At $18, the Hakuhodo J5523 is priced lower than similarly shaped brushes from other brands (MAC 217, for instance), and from what I have read online, it is also the better brush in terms of quality. Definitely a must-have! 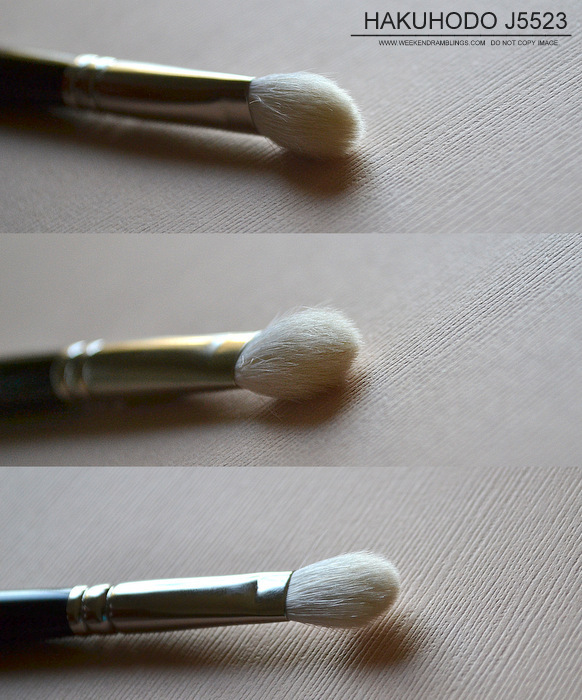 MORE MAKEUP BRUSH REVIEWS HERE. Links provided are for information only are NOT affiliate links. I love this brush and it has been my go to eyeshadow application brush for over 3 years - and I have 5 of them in my collection and I am planning on buying a few more.